Have any burning questions about space? Come join an informal discussion with one of our female educators. We will be outside under the stars answering all of your questions and, weather permitting, viewing live images of deep space objects through one of our telescopes. 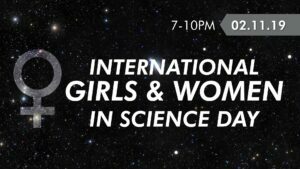 Also, come and listen to a special talk by a female astronomer, Deidre Hunter, who will be talking about her experiences and obstacles in her current research.